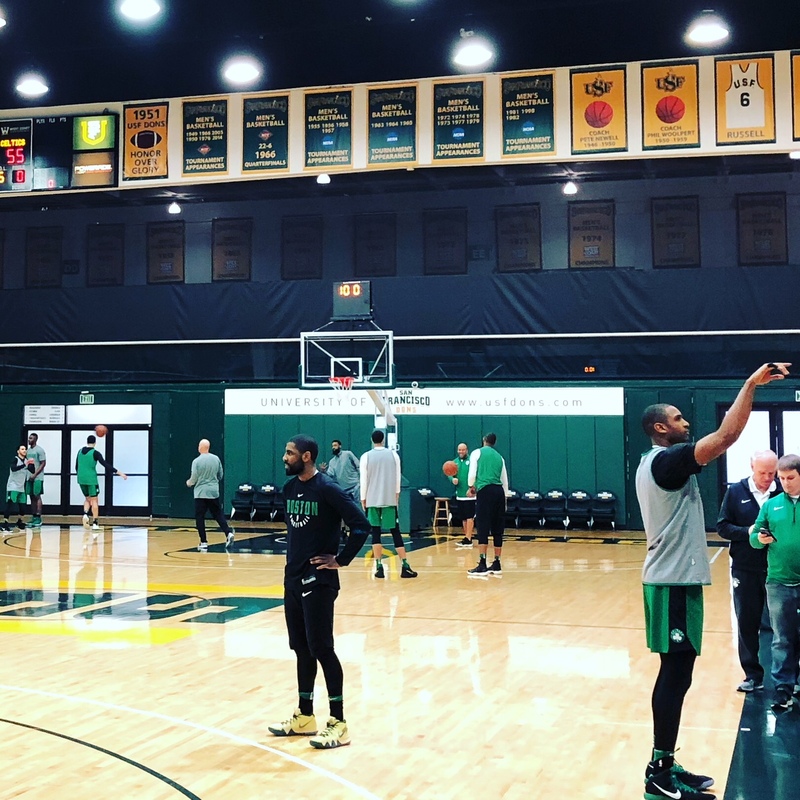 SAN FRANCISCO — Boston Celtics forward Jaylen Brown gazed up at Bill Russell’s retired jersey in the War Memorial Gymnasium rafters in San Francisco Jan. 26 after practice. The University of San Francisco legend, of course, went on to become a Celtics legend. Brown showed his respect in millennial fashion by putting a picture of the Naismith Memorial Basketball Hall of Famer’s retired No. 6 jersey on his Instagram story. Russell played on 11 of the Celtics’ 17 NBA championship teams. Brown, on a Celtics squad that overcame the loss of All-Star newcomer Gordon Hayward to own the East’s best record, believes this team has the talent to make a run at accomplishing this year what Russell did 11 times. The 2010 Eastern Conference champion Celtics were the last East team without LeBron James on the roster to make it to the Finals. James has won three NBA titles during seven straight Finals appearances with the Cleveland Cavaliers and the Miami Heat. The Celtics, however, made major moves last off-season to try to change regular programming in the East by acquiring All-Star point guard Kyrie Irving from the Cavaliers and veteran forward Marcus Morris via trade, drafting Duke star forward Jayson Tatum and signing free agent All-Star Hayward. The Celtics entered this season as a true challenger on paper to James’ throne atop the East with their three newcomers alongside Brown, starting center Al Horford and defensive-minded guard Marcus Smart. Those Celtics title hopes suddenly appeared lofty, however, when Hayward fractured his left ankle in the season-opener at Cleveland on Oct. 17. “At the time, Marcus Morris still wasn’t playing. It was myself, Kyrie and [Aron] Baynes and everyone else was really, really, really young guys. You’re looking around like, how are we going to do this?” Horford said. The Celtics have certainly responded. Horford credited Celtics coach Brad Stevens for quickly making the needed adjustments by “simplifying things” and managing their 10 starting lineups and rotations intelligently. The Celtics have the East’s top record at 35-15 entering Monday with the Toronto Raptors on their heels and some breathing space from the Cavaliers. Horford said he is “100 percent” surprised that the Celtics have played this well after Hayward was injured due to their youth, but he now believes they have an opportunity to be special this season. One of the Celtics’ strengths this season is a next-man-up mentality regardless of experience. Along with Hayward’s absence, Morris has missed 22 games this season with a knee injury. Smart is out with a recent hand injury. Brown and Tatum, however, have been outstanding in helping pick up the slack. Celtics youngsters Brown, 21, and Tatum, 19, are both averaging better than 13 points and shooting better than 35 percent from 3-point range while each averaging 5.5 rebounds. “I don’t think you would have ever guessed that a 19-year-old would be thrown into that situation,” Stevens said. “But two things. [Tatum] is very emotionally mature for his age. And No. 2, you benefit from playing with Kyrie and Al. And those two guys take a lot of pressure off our other players and have really, at the same time, brought our young guys along and encouraged them. Another key for the Celtics has been their still-elite defense. Boston entered Sunday leading the East in defense and second overall in the NBA by allowing 98.5 points per game. The Celtics led the NBA in field goal percentage defense, holding foes to 43.3 percent. Keep in mind that the Celtics lost standout defensive player Avery Bradley in a trade to the Pistons in the off-season as well as shot-blocker Amir Johnson in free agency. Stevens credited Horford and Baynes for being the anchor of the Celtics’ defense, the length of their team and communication. Perhaps the main reason for the Celtics’ East-leading play is the arrival of Irving. Irving is averaging a team-best 24.8 points, five assists, 3.7 rebounds and 2.7 made 3-pointers per game. The five-time NBA All-Star has scored better than 40 twice this season and scored 37 in a 109-105 loss to the Warriors Jan. 27. No longer alongside James, Irving is the primary leader on a team for the first time in his NBA career and is flourishing in that role. “I know what he is about. He’s an amazing player,” Warriors All-Star guard Stephen Curry said. The big question for Boston now is will its title hopes get a boost with a return from Hayward. Hayward averaged 21.9 points, 5.4 rebounds and 3.5 assists for the Utah Jazz last season. The Celtics definitely could use his scoring when Irving is out of the game. The 2017 NBA All-Star is out of a walking boot and there have been some whispers of his return this season. Stevens, however, dashed any hopes of a Hayward return when asked about him before the Warriors game. Horford added that his hopes for Hayward are more “wish him well” with no pressure among his teammates. Irving agreed. “I just want Gordon to do what’s best for Gordon. That’s it. That’s all,” Irving said. Before Saturday, the last time Irving had been to Oracle Arena was when the Warriors won the 2017 NBA Finals by eliminating the Cavaliers with a Game 5 victory. Irving hit the game-winning shot in a deciding Game 7 during the 2016 NBA Finals to give the Cavaliers their first championship. With Cleveland, Irving has played against Golden State the last three NBA Finals and has become quite familiar with this venue. So, could Irving return to the NBA Finals at Oracle Arena this year as a member of the Celtics chasing the franchise’s 18th championship? “That’s the hope,” Irving said. “We got to see what happens from now. Anything can happen from now until the playoffs start. For us, we have so much room to grow and learn one another. It’s new for us. But when we play against the best, we raise our level. There is a consistency that you have to build to be one of the best teams in this league.